Got your summer reading list picked out, yet? Well, aside from those juicy romance novels that you'll be reading pool side with a cocktail or lemonade, you might want to add one more to your list. 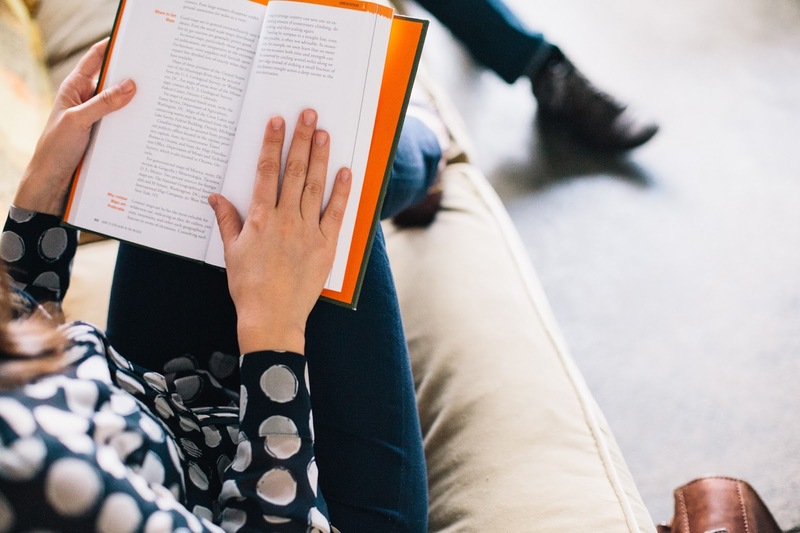 Summer is the perfect time to leisurely catch up on some professional literature where you can really absorb some new teaching practices and prepare new strategies for the upcoming school year. Now, let me tell you where I was in my teaching at this point. I wasn't a new teacher anymore (thank goodness! ), but I also didn't have all my ducks in a row either. It's kind of that awkward stage where you've got one foot in the water and one on land. Can you relate? So, you can image how happy I was when I received some pure teaching gold in the form of this book. It TOTALLY transformed how I taught reading in my classroom. Now, let me begin with a quote from the book: "Teach the reader, not the reading"
This quote sets the tone for how to think about reading instruction as you work your way through the book. Sometimes we get so caught up on making sure our students understand the content of what they are reading, but we don't teach them HOW to read and understand it. ..or other variations that refer to the same comprehension strategy. But throw out a word like "synthesizing" to your students and you might get more than one blank stare. Here's what we don't want: We don't want our students to have to spend so much time thinking about what a strategy word even means before they even can learn how to use it. What IS important is that we teach these strategies so that they are useful and make sense to our students. Using kid-friendly language is the first step. Ah - now those are some words that will instantly make sense to readers. Now, if you're working with older students, you may still want them to use the technical terms (which is totally fine). What you might consider is using the kid-friendly terms first, and then begin to use the technical ones in conjunction with them, working your way into using them interchangeably. Here's what I love about this book. Boyles gives you the play-by-play of how you teach students what these strategies mean AND how to teach them to use them in their reading. Boyles helps you understand how to use these strategies when teaching fiction vs. nonfiction. For example, when reading fiction you might NOTICE how a character is changing over the course of the book, but in nonfiction you might NOTICE important text features that help you understand the content better. You can use the noticing strategy in both genres, just differently. The book goes into greaaaaat detail (we're talking "teaching reading for dummies" style - which was totally what *I* needed) about how to teach these comprehension strategies in shared, guided, and independent reading settings. 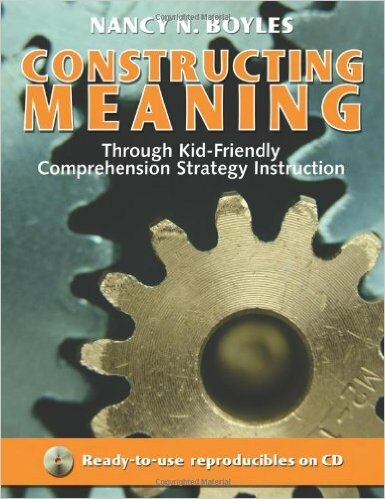 When I began to use the practices introduced in this book, my guided reading groups got waaay more focused. I learned how to teach the concepts of the book THROUGH the reading strategies. 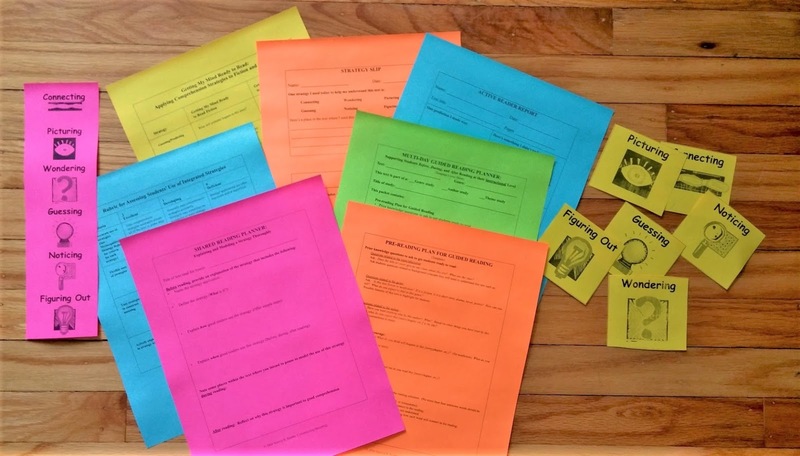 She even gives you a lesson plan template to help you incorporate strategy instruction into your daily lesson (along with sample lesson plans - super helpful). Now here's a biggie: We can teach the strategies beautifully, but we will only know how effective it is when we assess how our students USE the strategies on their own. There is a whole chapter devoted to the assessment of the strategies including rubrics and learning indicators letting you know if your students "get it." Here's one thing that I did that helped me to know which strategies my students used successfully and which strategies they either ignored completely OR were using incorrectly. TO USE: Write the students' names in the guided reading group on the far left. Each time you see a student use a strategy correctly in your guided reading time, mark a tally in that column. 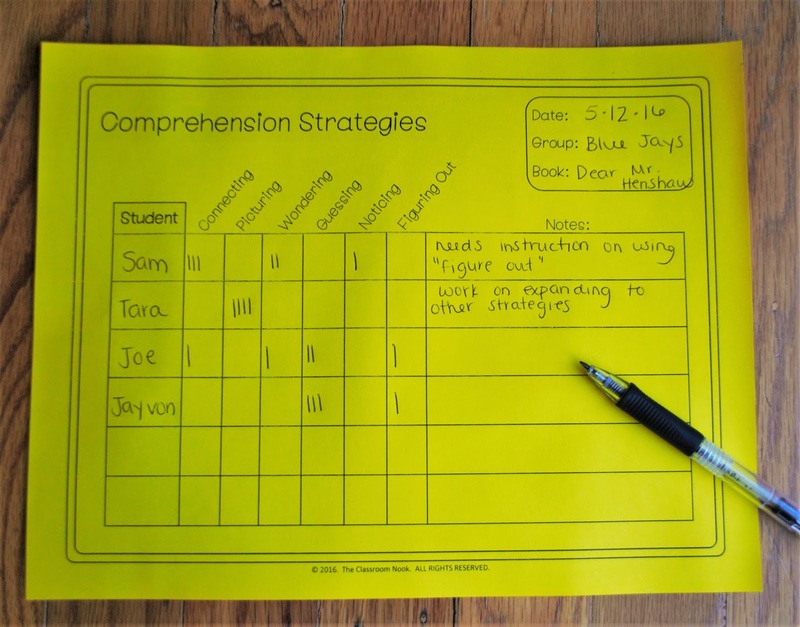 Use the "notes" section to jot down other observations about their strategy use. Feel free to download your own copy. I could then use this information when conferencing with students individually to explicitly teach correct usage of the strategy or refresh the student's awareness of the strategy. Now if you're like most teachers, you love ANYTHING that's gonna save you time. This book comes complete with teaching resources including handouts for student activities to use when teaching each strategy, posters of each comprehension strategy for visual reminders, teacher and student instructional tools to use in guided reading groups, and student bookmarks with the comprehension strategies printed right on them for even more visual reminders of the strategy. You'll get all these resources on an attached CD in the back of the book. Please, and thank you! The best part about the book is just how easy it is to read. It's so clear and gives you an awesome foundation for your reading instruction. I so wish I was given this book upon graduating from college as a "Read me now and thank me later" gift. It would have helped immensely. So, now it's your turn: What professional development books have you read that have shaped your teaching?